The best bang-for-buck when shopping for a solid state drive is still found in the SATA 6Gbps category, but it will only be a matter of time before PCIe-based SSDs come down in price. To get the ball rolling, Intel announced half a dozen new models equipped with its 3D triple-level cell (TLC) NAND flash memory. 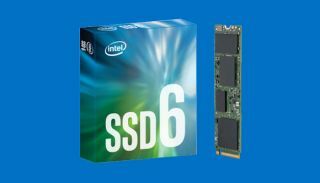 Intel's new drives take aim at different market segments from the embedded category all the way up to data centers. The one that's of most interest to home consumers at large is the 600p series. These aren't enthusiast grade solutions that push the performance envelope, though compared to SATA 6Gbps drives, they're rated to run markedly faster, at least in read performance. Just as importantly, the price points of the new drives make them accessible to anyone with a motherboard supporting M.2 drives and who wants to leave behind the performance bottleneck of SATA. As is often the case, the higher capacity drives offer the best value, culminating in the 1TB drive, which is priced at around $0.35 per gigabyte. Pricing is competitive compared to other NVMe SSDs, though we've seen better performance metrics, particularly from Samsung's 950 Pro and OCZ / Toshiba's RD400 models. It's also worth pointing out that Intel will at some point release its Optane SSDs, which promise to kick performance up several notches. Still, the 600p series is an interesting release and one that could help bring wider adoption of NVMe SSDs. The most direct equivalent is Samsung's OEM-only PM951 NVMe drives, which still cost more and don't have a 1TB capacity option. Overall, this is good news for anyone hoping to see improved pricing for M.2 NVMe solutions.